The 9-to-5 office wardrobe for the turn-of-the-century working woman. A 1904 vintage film clip features almost 200 women taking their time checks at Westinghouse Works. As these working women file past the device on the wall we are introduced to the Edwardian working women’s wardrobe. The long line of workers with their hair pulled back and on top of their heads, are dressed in dark gored skirts with simple shirt-waists, some with a large bow at the neck. Many have a chatelaine bag attached to their belt to carry their belongings. Following the film clip are examples of the styles of skirts, shirt-waists, and chatelaine bags available in 1904. Left: Shoulder straps ornamented with fancy stitching are a feature of the shirt-waist pictured. The blouse displays fullness at the shoulders and neck in front regulated by gathers, and also at the belt. A removable collar conceals the neck-band. 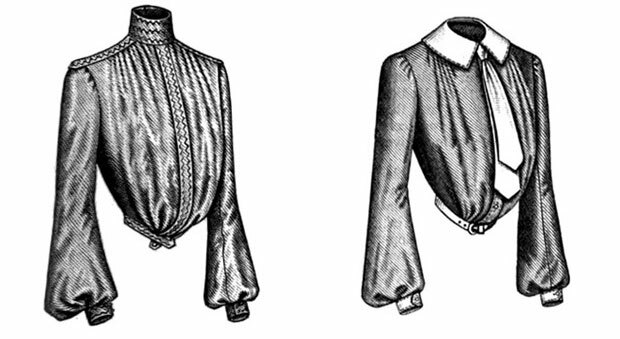 Right: The shirt-waist or shirt-blouse is tucked at the shoulders with full length bishop sleeves. The blouse features a plain collar with a long tie. This shirt-waist is worn with a leather belt. Left: The tailored shirt-waist is characterized by a round collar and full-length bishop sleeves. This style is frequently worn without a jacket. 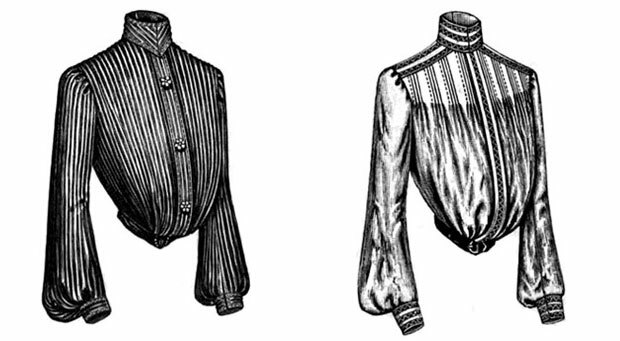 Right: The shirt-waist or shirt-blouse is characterized by front gathers to the shoulder yoke and full length two-seam bishop sleeves. Left: A ladies all purpose five-gored flared skirt is practical for all occasions. 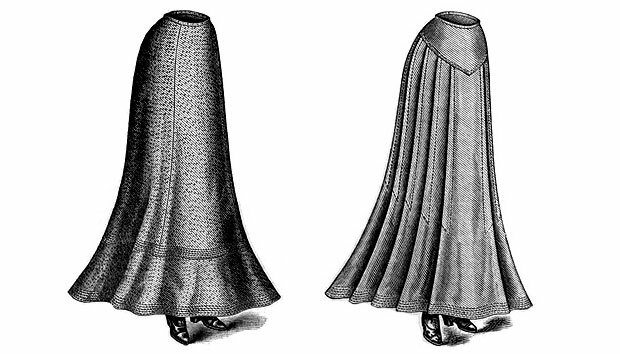 An inverted box-pleat is at the back and a circular flounce extends about the skirt. About 3 ½ yards of fabric is used. Right: A ladies five-gored skirt in a short-round instep length is practical for daily use. It has lengthwise side-pleats stitched to the flounce with a yoke extending about the skirt. Chatelaine bags were popular for the working woman, not only from an ornamental view point, but as articles of use. With one or no pockets in the popular gored skirts, the working lady grew tired of thrusting her handkerchief up her sleeve and attached a purse to her belt to carry the essentials to get through the day. The most popular styles were of grained leather with a nickel catch, chain, and belt hook. Some styles featured leather straps in place of a chain. More than 200 years of delicate, luxurious, and immaculately crafted lingerie is exposed.